Apex Medical Center (Las Vegas) - Book Appointment Online! 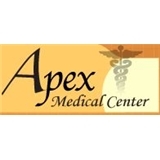 Apex Medical Center is a comprehensive pain management center and primary care practice established locally in 1999. We have ONE GOAL - to relieve pain and restore optimal mental and physical function. Apex Medical Center specializes in treating patients with ailments such as migraines, neck and back pain, spinal injuries, arthritis, complications from stroke, joint and muscle pains, pinched nerves, hand and foot pains, disc degeneration, pain after surgery and fibromyalgia. Because Apex Medical Center is a comprehensive medical center, we also treat other medical problems such as diabetes, hypertension, depression, respiratory problems, allergies, gastrointestinal, liver and kidney ailments, skin ailments and more. Our culturally diverse staff speak many languages to better assist our patients. Dr. Bonnick is honestly fantastic. I have been struggling with depression for awhile but I have anxiety about medicating for it. She was very calm, never made me feel stupid for my symptoms. She was super understanding and just, overall fantastic. She is extremely thorough with our checkups too and makes sure to answer all of my questions patiently even it's the same one repeatedly. She's very awesome. I was recommended her by a friend and I would recommend her to anyone.